When it comes to delivering a pitch, Oren Klaff has unparalleled credentials. Over the past 13 years, he has used his one-of-a-kind method to raise more than $400 million — and now, for the first time, he describes his formula to help you deliver a winning pitch in any business situation. Whether you’re selling ideas to investors, pitching a client for new business, or even negotiating for a higher salary, “Pitch Anything” will transform the way you position your ideas. how the brain makes decisions and responds to pitches. With this information, you’ll remain in complete control of every stage of the pitch process. 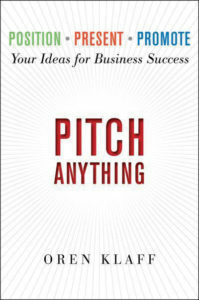 “Pitch Anything” introduces the exclusive STRONG method of pitching, which can be put to use immediately. results and transform your life. Ferriss reached out to the most impressive world-class performers in the world, ranging from wunderkinds in their 20s to icons in their 70s and 80s. This book contains their answers — practical and tactical advice from mentors who have found solutions. 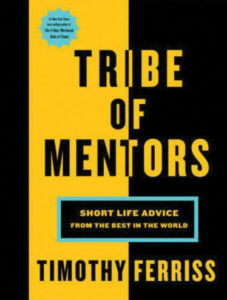 “Tribe of Mentors” includes many of the people Ferriss grew up viewing as idols or demi-gods. No matter your challenge or opportunity, something in these pages can help.